Those who said last week that they disagreed with Colin Kaepernick’s methods but agreed with his goals owe him an apology. I’m not against the military. I’m not against the police or America. I’m just against social injustice.… I’m proud of it. I don’t regret it. I know this is right…. I feel like this is the right platform. I feel like this is our only platform to be heard. A lot of time people want us to just shut up and entertain them. Shut up and play football. But we have voices as well. We’re actually educated individuals that went to college. When we have an opinion and speak it, a lot of people bash us. Marshall then also pledged money to a variety of charities. The linebacker has now joined volleyball players, soccer players, scores of veterans in the stands, and fellow football players who are hearing the anthem, thinking about police violence, and taking a knee. 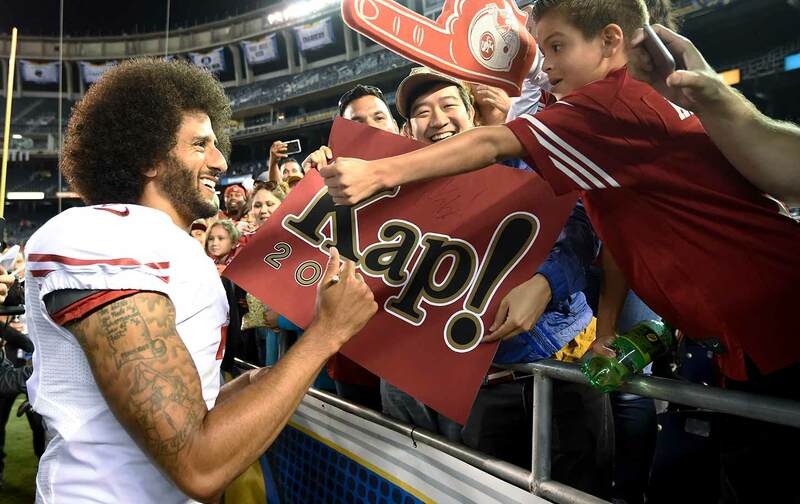 Yet, while we should be wary as more and more players and teams rush to say “me too,” it is a sign that Kaepernick is winning. Maybe the others will, consciously or unconsciously, blur the central motivation of Kaepernick’s protest—“police are getting away with murder”—but that always happens when people realize that you are walking with the wind. It is best to celebrate that people are rushing to Kaepernick’s side while also fighting to amplify the actual message, which is not to “honor the country” but to challenge the country to resist police violence and extrajudicial killings. Some will continue to bash these “methods.” Others will co-opt and commodify. But Kaepernick is giving us a textbook example of what Howard Zinn said, which is especially apt this presidential season: “What matters most is not who is sitting in the White House, but ‘who is sitting in.’ In this case, it’s kneeling, not sitting, and it has been strikingly effective.